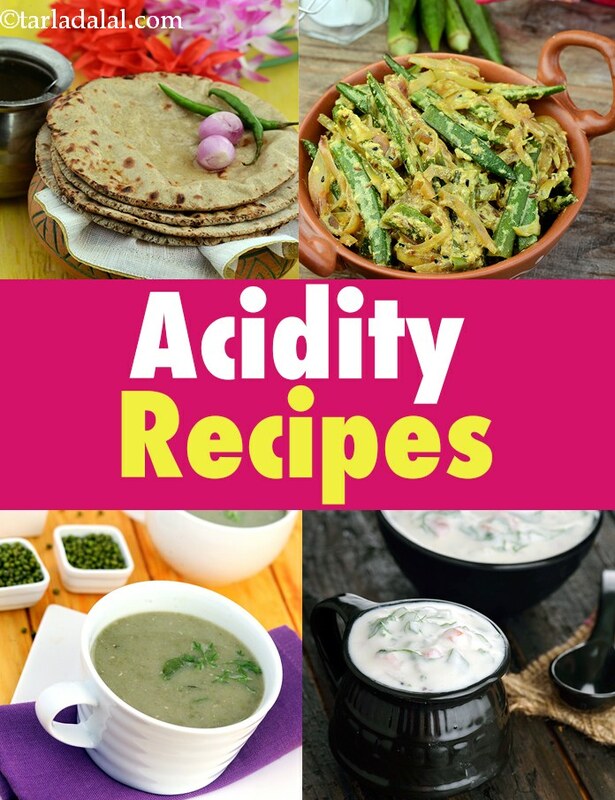 acidity recipes, recipes to control acidity, Indian acidity recipes. We show you which foods are good to control your acidity and what are the casues of acidity. Enjoy our collection of recipes to control acidity which you must follow to leave a healthy life style. For those who suffer from acidity look at all the details below. Acidity is a form of indigestion in which there is accumulation of acid leading to a burning sensation in the stomach and the digestive tract. The stomach periodically produces acid to aid digestion. It is when we don't eat at regular intervals or are excessively stressed the stomach produces more acids which harms our body. Our acidity is measured by our pH level which ranges from 0 to 14. The lower the pH level the more acidic your body feels. A 7 pH is a neutral level of, while its always better to keep your body slightly alkaline at a pH of 7.35 to 7.45. When your alkaline you will always feel better. It’s like a high and you only realise this when you shift from acidic to alkaline. This has to be done all day as the body’s pH level keeps shifting. Fortunately the kidney controls most of the body pH levels. But still, we highly recommend staying alkaline as it has numerous health benefits. Remember that acids are released from the stomach every 3 to 4 hours to breakdown the food we eat. So its always good to eat regular small meals otherwise the acids will attack the lining of the stomach to create acidity. 'Hurry, worry and curry', in other words: eating in haste, stress and spicy foods are the primary causes of acidity. Besides these, given below are some of the other causes for acidity. Listed below is the list of acidic and alkaline foods, which will help to make your food choices very simple. These foods are classified on the basis of their acidic or alkaline nature, however there are certain foods that are acidic in nature but on digestion form alkali in our body and do not cause or aggravate acidity. So if you suffer from acidity quite often try to avoid or restrict acidic foods (as given in the table below) whereas alkaline foods can be eaten freely. Although these foods are classified for you to make wise choices, the reaction of each food is very individualistic and vary from person to person hence pick up foods that suit you the best and help you keep away from acidity. Cereals Cereals like wheat•, rice•, dry corn etc and their flour, their products like bread, pasta, noodles, vermicelli, poha•, rawa•, oats•, brown rice•, buckwheat•• and ragi(nachni)••. Jowar, and bajra. Pulses & Legumes All dals• and pulses• especially tuvar dal•, soyabeans• and its products like milk, granules, chunks etc., chana dal flour (besan) etc. All sprouts. Milk and milk products Cheese, paneer, mayonnaise, butter and cream. Milk* chilled), curds*, ice creams* and milkshakes*. Vegetables Asparagus tips (white) and cooked spinach. Green leafy vegetables like raw spinach, fenugreek, amaranth etc. lettuce, asparagus greens, cabbage, brinjal, ladies fingers, mushrooms, green peas, cucumber, onions, potatoes, carrots, pumpkin, radish, tomatoes, broccoli etc. Fruits Plums, olives, prunes, lemon**, oranges**, pineapple**, sweet limes**, processed fruit juices, canned fruits. All other fruits like bananas, mangoes, grapes, apples, berries, figs, papaya, peaches, watermelon, chickoo, pear, muskmelon etc. Nuts and Oilseeds Dry coconut, walnuts, peanuts, and cashewnuts. Almonds, dry figs, dry dates, raisins, apricots and fresh coconut. Miscellaneous Tea, coffee, alcohol, vinegar, aerated beverages, spicy and fried foods, pickles, chocolate, MSG (Mono Sodium Glutamate), margarine, fermented foods like idlis, dosas, dhoklas etc, confectionary, mithai, sugar, artificial sweeteners, non-veg foods, eggs and other processed foods. Ginger tea, herbal tea, honey and cinnamon. • These foods are acidic in nature but are an important part of our daily diet and are nutritious too, hence do not avoid them totally. These foods may react differently for each one of us, hence eat them in moderation and combine with other alkaline foods e.g. mix rice (acidic) with lots of vegetables (alkaline), have chapati (acidic) with sprouts (alkaline) etc. With time find out which foods, and in what quantity from this category suits your body constitution. •• This food is difficult to classify as acidic or alkaline hence have it only if it suits you. * These foods are considered to be neutral, however their reactions are individualistic. Hence have them in the amounts that suit you. ** These fruits are acidic in nature but on digestion they turn alkaline and thus do not cause acidity. However if you already have acidity, its excess consumption may aggravate it, so have them in the amounts that suit you. Enjoy our acidity recipes and other acidity articles below. Tarla Dalal We are very happy to know you have loved the recipe. Do try more and more recipes and let us know how they turned out. Happy Cooking ! !